Here is a pic of my fur baby. He's four year old Beaux. Beaux is our only pet. It seems like every time a camera is around he will pose and smile for it. He is a beautiful 100% imported from Germany! As you can see in the picture, we only use medicine balls for his toys and all he does is tear them up. He is a HUGE sweetheart and loves to play with kids and will play fetch until your arm is tired. We just started our process of making him a rescue dog and i must say, he is LOVING that! Hope you enjoy the beauty of Beaux as much as I do. He just started with a search and rescue team, which he seems to enjoy it. When we practice at search & rescue at home, Beaux gets excited to be able to work and locate. What a handsome boy your GSD Beaux is! And I love the picture you've sent in - very nice! He sounds like a typical German Shepherd based on how you've described him too. And the search and rescue training is such a cool thing. Good for you both! 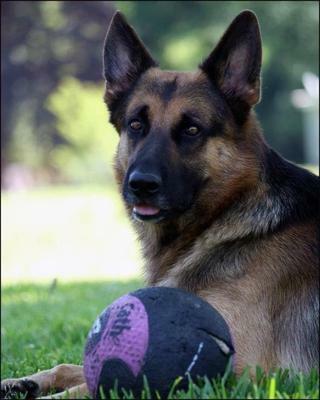 And if you're looking for a toy he can't destroy I definitely recommend that you try out the Varsity Ball (https://www.total-german-shepherd.com/Varsity-Ball.html) - he won't break that one for sure. My boy has one and is in love with it!